As an undergraduate research technician, Chris Lampart helps to monitor the health of Vermont's moose populations. "Now I know I want to be a researcher." Kristen Switzer finds her future in environmental research. Kevin Ostrander uses his game bird research experience to lead career-building events for other students. Mike Perrin designs his environmental studies major to build a career in conservation. The Dirt on Greenhouse Gases. Assistant Professor Carol Adair's research on greenhouse gases will help Vermont farmers modify agricultural practices to improve water quality and mitigate climate change. Exploring Many Interests On HER Path to a Career. Diana Gurvich pursues her many interests to take her forestry major in new directions. 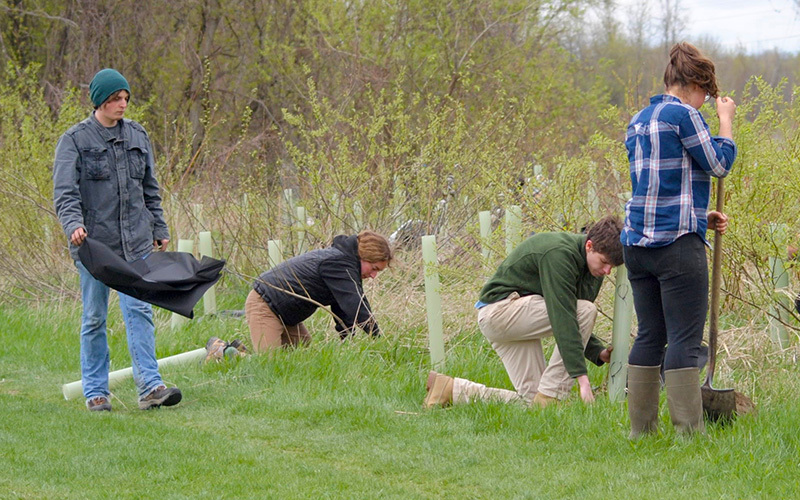 MAKING CHANGE: From RESEARCHING CLIMATE CHANGE TO SUPPORTING STUDENT PEERS. Kunal Palawat found his place at UVM in climate change research and student engagement. Zeroing in on a career. Travel study, internships, service-learning, and a semester as a teaching assistant helped Emily Bogan zero in on environmental education as her career of choice. Forestry to Fight Climate Change. Professor Bill Keeton does research to accelerate development of old growth forest conditions and enhance carbon storage. Youth climate education leader makes global environmental education 30 under 30. Youth Climate Summit organizer Gina Fiorile '18 continues her efforts to make change and take action by inspiring others. Learn through experience - outdoors, in the community, in the classroom, around the world. The Rubenstein School claims a storied history of preparing environmentally and socially responsible leaders, scientists, practitioners and advocates who understand the interdependence of people and healthy ecological systems. A science-based curriculum, focused on experiential learning, inspires students to apply knowledge to real world projects. Students graduate with the skills needed to make change and resolve complex environmental challenges. Do an internship, conduct research with faculty, take a service-learning or travel course, explore jobs in your field, study abroad.